Learn how to make dairy-free (paleo!) 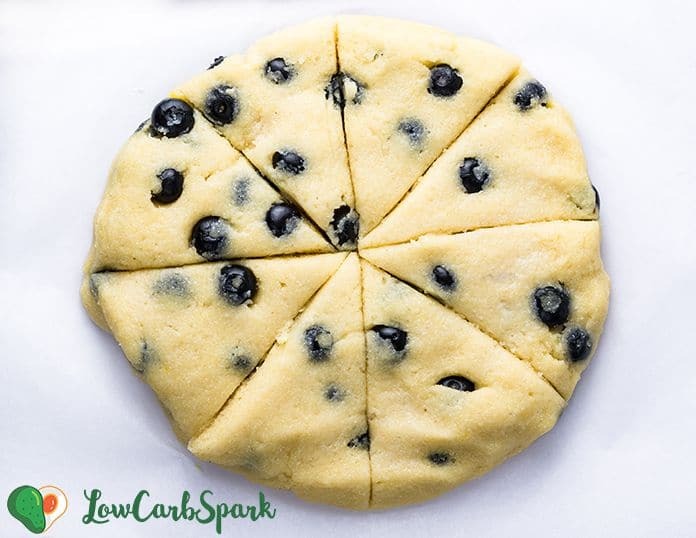 keto blueberry scones recipe that is perfect for a quick breakfast or snack. 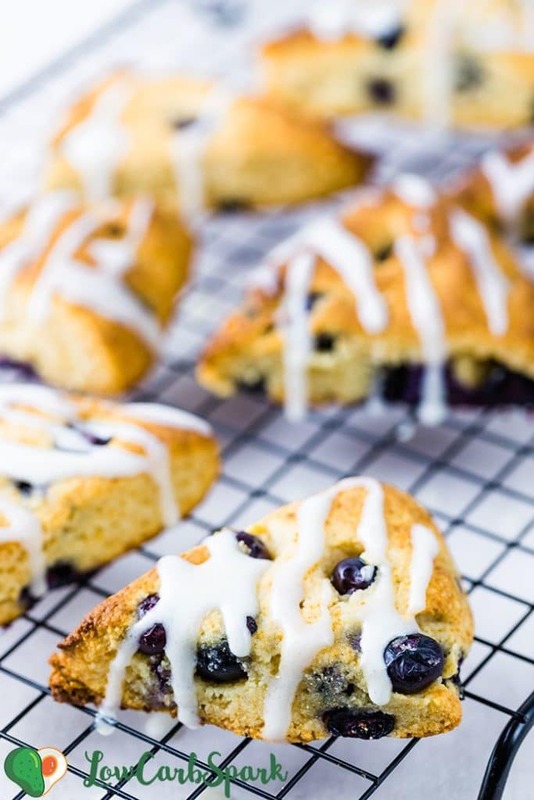 Enjoy these moist scones with juicy blueberries that’s topped with a sugar-free exquisite lemon glaze. 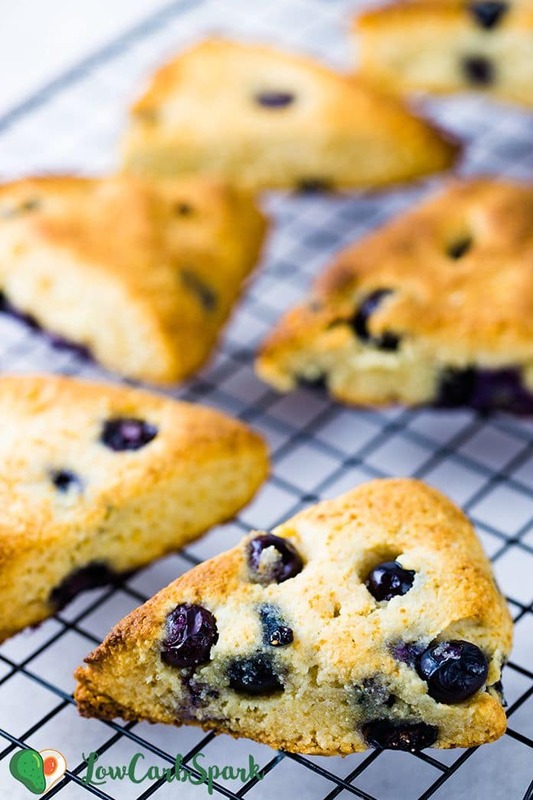 Their texture is fantastic: crispy edges, soft, tender and buttery – melt-in-your-mouth scones. 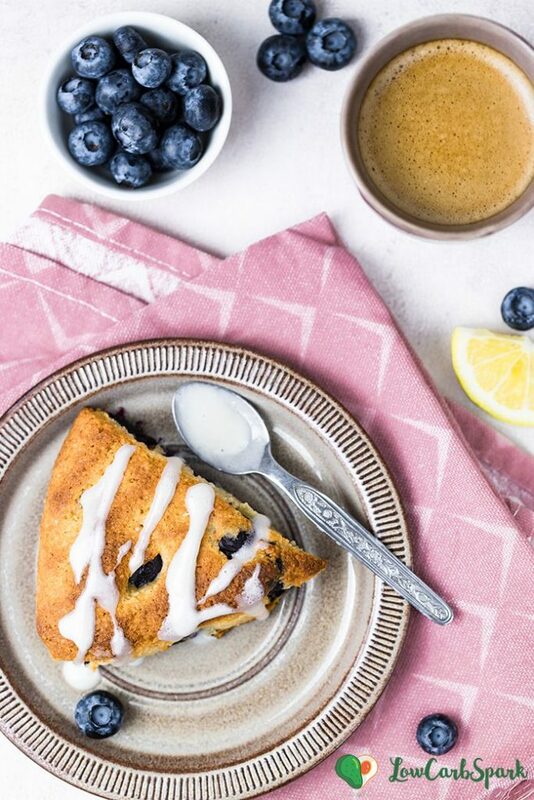 Blueberry Bread, Blueberry Muffins, Blueberry Cobbler, Blueberry Pancakes – this blog is filled with blueberries recipes. I love this low carb fruit and baking with them is a pleasure. These scones are perfect with any fruit you like: strawberries, raspberries. Some sugar-free chocolate chips would be fantastic for all the chocoholics out there (me included!). These are the best keto scones you’ve ever tasted. Flakey, buttery, so very tender and moist – an irresistible treat! The sugar-free lemon glaze will make everyone love them. You can make the scones however you prefer. 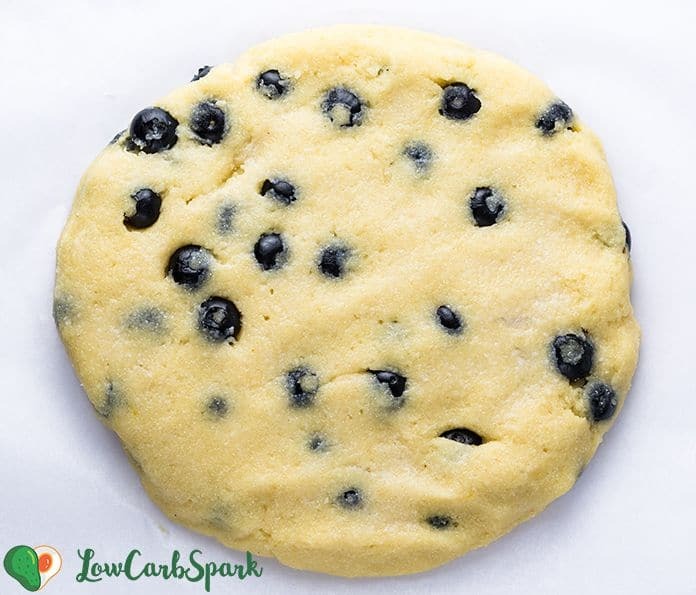 Use a biscuit cutter to make little circles or scoop some of the dough and turn them into little cookies. My favorite way is shping the dough into a disk and cut it into beautiful triangles. 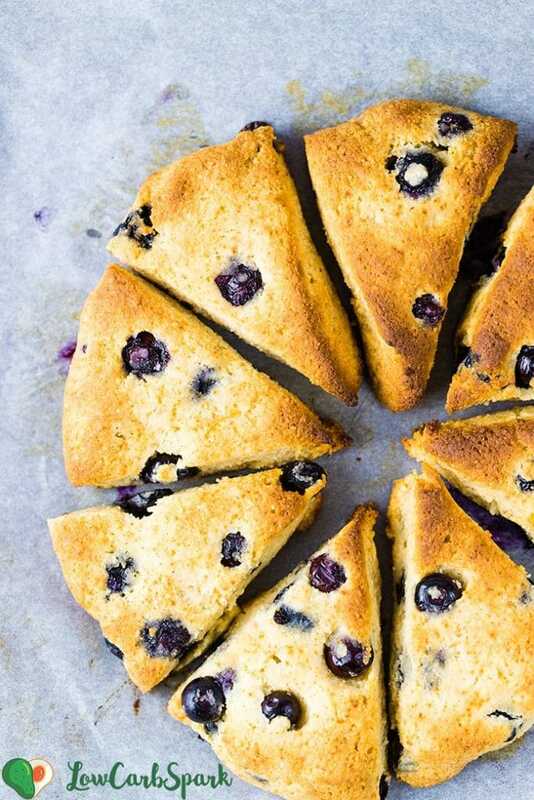 To make this fantastic blueberry scones, you’ll need a few low carb ingredients that you may already have in your pantry. The blueberries and lemons complement each other perfectly. 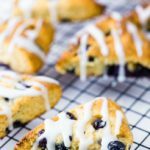 How to make keto lemon blueberry scones? In a bowl combine dry ingredients: almond flour, coconut flour, baking powder, sweetener, xanthan gum, salt. Set aside. With a mixer beat the eggs, coconut oil, vanilla extract for about 2 minutes until bubbles form. Combine the dry ingredients with the egg mixture. Using a spatula incorporate the blueberries. Let the dough sit for a few minutes. Using your hands shape the dough into a circle about 1” thick and cut into 8 triangles shaped pieces. Gently move the keto blueberry scones onto the baking sheet. Bake for 22-25 minutes or until lightly golden and well cooked. Remove from the oven and let them cool down for a few minutes. To make the glaze whisk all the ingredients together and drizzle over the baked scones right before serving. How should I serve the scones? Usually, scones are served with different kinds of jam. If you are looking for a quick low carb jam recipe, try the easy chia jam (ready in less than 10 minutes). Another way to serve these scones is with lemon curd. 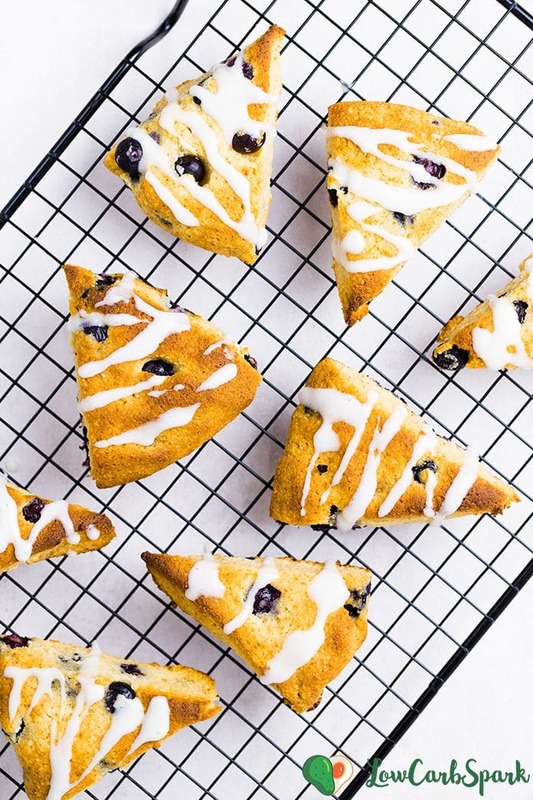 It complements perfectly these keto blueberry scones. Be generous with the lemon curd! Or you can add a scoop of your favorite keto vanilla ice-cream. How many carbs are in the blueberry scones? This recipe is made with coconut and almond flour, which are the best replacements for wheat flour. Each serving has 8g carbs, 3g fiber, so 5g net carbs in this delicious low carb dessert. Tip: Eat the scones while they are still a little bit warm. Store the leftover scones in an airtight container.